Come to the club on Tuesday, July 1 at 1900 to celebrate the team's victory. PENSACOLA, FL (June 29, 2014) - Regardless of what happens in Sunday's final race, SYC has secured it's seventh straight Challenge Cup victory. Besides the team sealing the deal with one race to go, two of the team's boats, ROUGAROU and BRUJA, have secured first place in their respective classes. The team will meet back at SYC to re-hang the banner in the bar. The SYC team consists of Andy Lovell skippering ROUGAROU (Melges 32, Burt Benrud/A. Lovell), Vice-Commo. Scott Sonnier on REVOLUTION (Melges 24), Norman Vallette, Jr. on DEMITASSE (J/27, B. Benrud) and Cardwell Potts, skippering SYC's own BRUJA (Soverel 26). See GYA.org for results. GULPORT, MS - The Gulfport to Pensacola fleet awoke to an unusual forecast this morning: a light northerly at the start, clocking to the west and building throught the night. After several years of upwind conditions, this edition may see spinnakers the whole way! The Pensacola Yacht Club will be open all night and, indeed, thirsty sailors may be arriving in the wee hours! 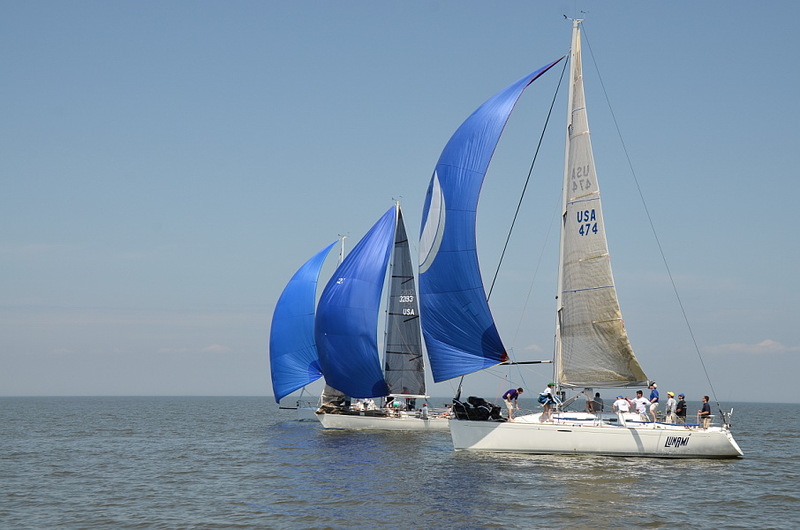 GULFPORT, MS - Light winds early and a building breeze in the Mississippi Sound favored the faster-rated boats in the 2014 edition of the Race to the Coast. The fleet was lucky through the bridges, as not one boat reported Bridge Time for the event. Almost all of the fleet finished between 730p and 830p. Read more for awards. 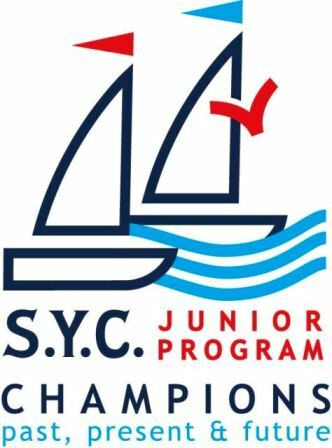 The 2014 SYC Junior Lipton Team was determined over the weekend with a double round robin series, no throw outs and the skippers rotating while the crews remained with their respective boats. Winning the series and earning the title of Team Captain was Dustin Brennan. Rounding out the team was Jonathan Pottharst and Pierce de Boisblanc with Davis Friend as alternative skipper. Kevin McKee and Michael Haupt also competed and had some great races.The crews were composed of Patrick Adams, Max Bell, Langston Goldenberg, Miller Goldenberg, Connor Housey, John Kemmerly, Kale Killeen, Amelie Lagarde, Nick Lovell, Harrison Mensezer, Phineas Thompson and finally Dwight LeBlanc IV, who greatly assisted by crewing. The annual Defender Challenge is hosted by SYC to honor - and entertain! - our local military sailors and their families. 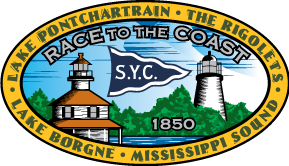 Southern Yacht Club and Allstate Sugar Bowl cordially invite your Optimist Team to attend the Inaugural Southern Yacht Club Junior Team Race Championship Regatta, May 16-18, 2014. 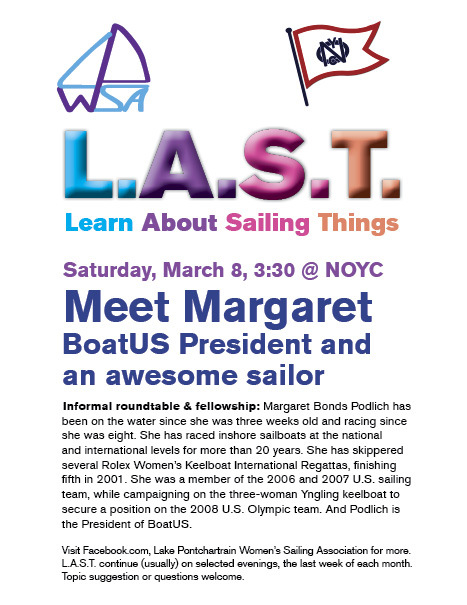 We look forward to having you in New Orleans for two days of Optimist Team Racing. SYC Commo. Ewell C. "Corky" Potts, III will be presented as GYA Commodore. Boats entered in Opening Regatta are entered in this series. Photo: The SYC officers aboard Guy & Dale Williams' CITY OF NEW ORLEANS, a vintage Broward 52. WEST END - Six high school teams from Texas, Louisiana, and Mississippi sailed one complete team race rotation today in Club 420s. Jesuit High School advanced to the National HS Team Racing Championship in Seabrook, Texas with a perfect 5 win, 0 loss record. Congratulations to the SYC based Blue Jay team, led by Jonathan Pottharst, Devin Keister, Connor Housey, Max Bell, Michael Haupt, Nick David, and John Kemmererly. Baker RESULTS - Photo of Jesuit Team Click on More.. Photos by Bill Meyers, M.D. NOR | Sailing Instruction | Who is Sailing? 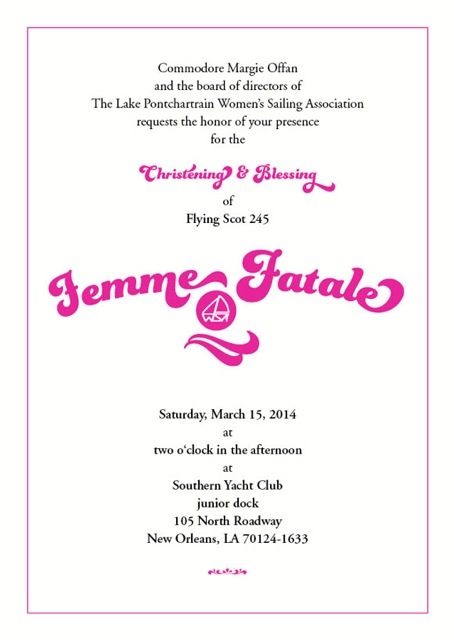 Fleet 96 and Southern Yacht Club in New Orleans, Louisiana welcome you and invite you to participate in the 2014 FSSA Midwinter Championship Regatta. Click here or Read More for FSSA Web Site and entry forms. Featured sponsors: North Sails, Quantum Sails, Ullman Sails.